We analyze geo-tagged BigData from multiple sources. Currently we have data on more than 200 million venues and update it daily. All the tracked data is cleaned, filtered, categorized and then constantly monitored. We process over 2 million activity signals every hour. Our carefully crafted algorithms generate a profile and TopPlace™ GeoPopularity scores for social activity categories, areas and places. The resulting insights make it easy for businesses and consumers alike to make much faster and more accurate decisions. 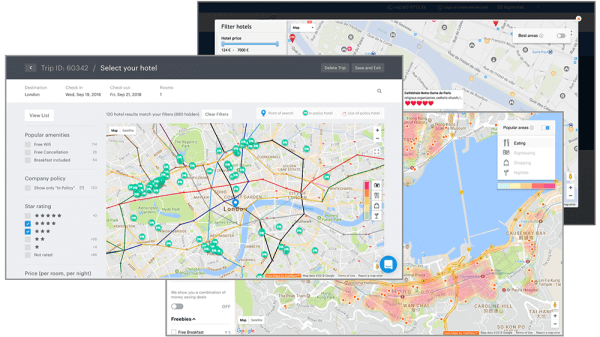 Complement your accommodation information with location scores, nearby top points of interest and public transport. TopPlace™ products help retain your visitors, increase conversions and increase the average booking value. Your customers receive instant location insights that suit their particular interests. All on your website, quick & easy. Our products are Plug&Play and integration only takes minutes. We take care of all infrastructure and traffic.